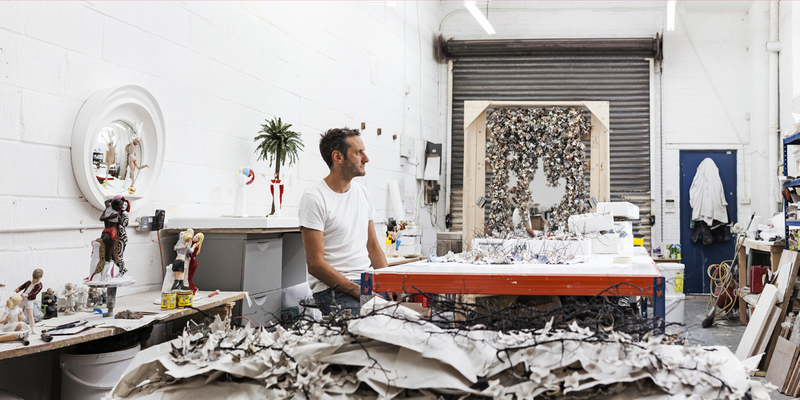 Barnaby Barford is an artist who works primarily with ceramics to create narrative pieces. He is best known for his work with both mass-market and antique found porcelain figurines, cutting up and exchanging elements or adding to them and repainting them, to create sculptures which are often sinister and sardonic but invariably humorous. With irony, he draws a portrait of our contemporary lives. Through his works, Barford explores all aspects of our society. Following in the tradition of Hogarth, Chaucer, Dickens and Shakespeare; with a dark sense of English humour and satire, Barford’s work explores and celebrates the human condition. Over the last few years his practice has developed and his last exhibition ‘The Seven Deadly Sins’ saw him breaking new ground making large scale ceramic sculpture exploring sin in our contemporary world and its association with the breakdown in community. Barnaby Barford (b. 1977) graduated from the Royal College of Art in 2002. He has shown his work internationally. He has been the subject of several solo exhibitions in the UK and most recently has had a solo exhibition at the Museum of Contemporary Art in Virginia, USA. His work is part of both public and private collections. He is currently represented by David Gill Galleries, St James’ London. Barford has worked with museum commissions, private commissions and most recently for Louis Vuitton. His work, through it’s incisiveness, beauty and humour has the rare ability to speak and engage with a broad section of people from many different backgrounds. Barnaby Barford has also directed a unique film based on his highly acclaimed artwork made from ceramic figurines for Animate Projects which was broadcast on Channel 4 in September 2008. Damaged Goods is a tragic love story played out by porcelain figurines. It explores notions of forbidden love, material wealth and class divides using the traditions of value within ceramics. This touching film was commissioned by Animate Projects and funded by Arts Council England and Channel4.